The Riga Main post office acquired the first semi-automatic machine, produced by the company Krag Maskin Fabrik A/S in Norway, in the middle of 1908 and in 1910 a second one. The first one had 8 "killer" lines (designed by "A") but the second one had 4 "killer" lines (designed by "B"), both machines were in operation until August 1917, just before the capture of Riga by German forces. The main component of the machine was a rotating printing cylinder on which the dies of two circular date stamps and two sets of "killer" lines were attached. A disk with knurled edge was rotating on the same shaft and thus transported the piece of mail along a guide while the dies performed the printing. Sometimes the knurled edge also left an impression on the mail. The printing cylinder of the Russian Imperial post office had a diameter of 2" which by one revolution performed an impression of approximately 156 mm. The length of the "killer" lines was 45 - 48 mm and the diameter of the circular date stamps was in most cases 28,5 mm. The German occupational civil postal service (Ob.-Ost till the end of 1918) as well as the post office of Soviet Latvian Republic (January to May 1919) did not use the machines. The Riga Main Post Office of the Republic of Latvia actually assumed regular operations in the middle of 1919. The postal equipment due to war and changes of political administration was lost or badly damaged and had to be made operational by improvised means. The post of the Latvian Republic refurbished the old machines and put machine "A" into operation in April 1920. One year later machine "B" became operational after needed reparations. 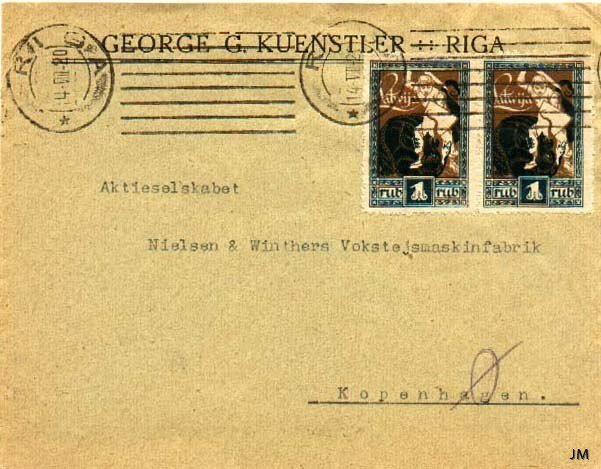 In the beginning the Riga post office continued the tradition of the Imperial Russian post by using only straight "killer" lines between the circular date stamps. Soon, however, slogans appear within these lines, and later on slogans completely replaced the "killer" lines in some cases. 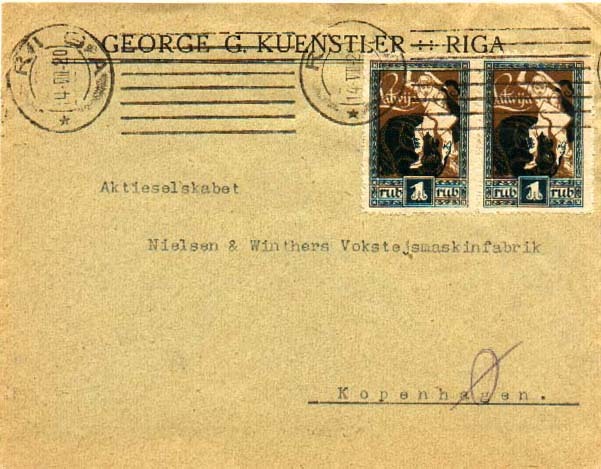 Until 1936 machine cancellations of Riga only are known. From mid 1936 a semi-automatic machine was in use at Cēsis Post Office and in 1940 machine cancellers also are used in Jelgava and Liepāja. Besides the cancelling machines of Riga also two hand-roller marks with serial letters "A" and "B" were in use during the period 1932 – 1938. Those were used on postal wrappers. The machine roller cancellations of the Republic of Latvia may be divided into three periods whereby, from 1922, mostly the two machines were in use simultaneously.